After reading his two previous novels, which rely heavily and equally on both words and images, I come to appreciate the way Brian Selznick creates his novels. 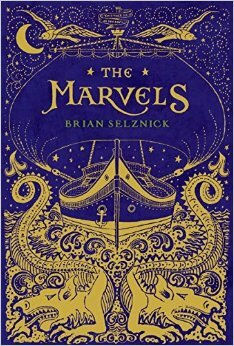 Certainly, the use of illustrations has already set Selznick apart from other writers, but it’s his third book, ‘The Marvels’, that makes me think of Selznick as a story-maker, rather than a traditional novelist. This is especially true with the way his kneads his stories together in the medium he works with. ‘The Marvels’ is divided into two parts, first depicted by illustrations, then narrated with words, each with a plot of their own. Both of these stories could have existed as a stand alone piece, although in my opinion, neither could have been as intriguing as when joined together. However, when I finished the novel, I realised that the collection of drawings, which chronicle the lives of the Marvels, a theatre performing family, are in fact a fictional tale told by one of the main characters in the ‘text’ part. The ‘text’, apart from following its own storyline, reveals the origins of the illustrations; it’s essentially a story within a story, as the book resembles a puzzle, so readers must connect all the pieces to appreciate the synergy produced by the two halves of the book. Initially I thought the author’s attempt to emulate his drawings like film sequences may not have worked as well as expected, although he did use film editing techniques, composing the images that he could arrange in order, so as to accomplish this cinematic effect. Like many readers, I’m fascinated by Selznick’s beautiful drawings, but his techniques may have potentially created an opposite effect. While his images are intricate with great details, I find there’s an absence of visual highlights, as the entire page is filled with dense pencil strokes, one where positive space outweighs negative space. After leafing through a series of his drawings, it becomes monotonous, lacking visual pacing, and all the illustrations did was strictly what they aimed to do without giving me an additional imaginative space. Likewise I think the ‘image’ part functions similarly to the ‘text’, and like words, these drawings give just enough information for the storyline. However, what I find fascinating, after re-reading ‘The Marvels’ numerous times, is that this ‘opposite’ effect, with functions that are similar to those of text, encouraged me to re-engage and re-imagine the scenarios in addition to the visuals, already presented in the drawings, now making the story even richer. It turns out to be a clever technique, so I realised what an ingenious piece of work this had been. The outcome proves how the author brilliantly made use of the book’s medium, and this led me to believe that Selznick not only creates narrative journeys that enlist the means beyond words and images, but also the story structure and its format, in the end making something that is utterly effective. This truly reflects that the whole is bigger than the sum of its parts, and for these reasons I strongly recommend ‘The Marvels’.